Last week I talked about what I learned from visiting a Canadian mushroom farm. I shared the 7 types of mushrooms that grow in Canada, and also spoke about their health benefits. 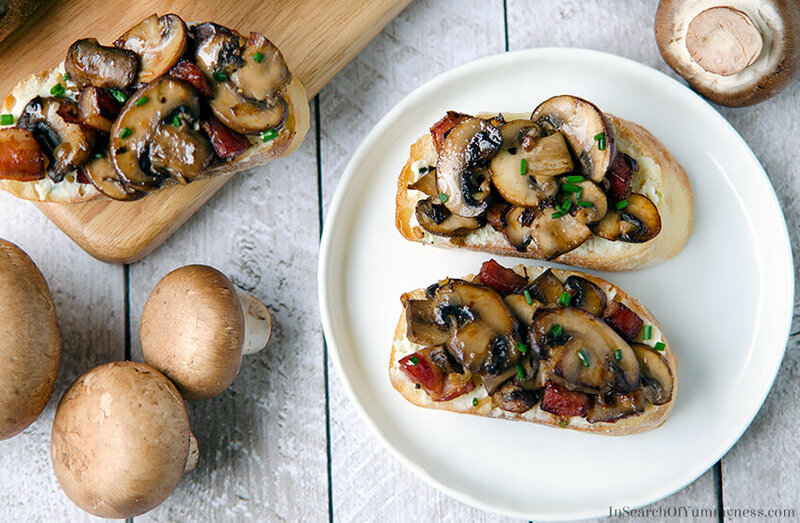 One of the most popular mushrooms that are grown in Canada are called cremini mushrooms, which are the star of these cremini and pancetta crostini. Cremini mushrooms have a meaty and earthy flavour, which can be more intense than white button mushrooms. This earthy flavour pairs wonderfully with the salty bite of pancetta and the creamy texture of Boursin cheese. A sprinkling of fresh chives add a bright, mild onion flavour that rounds out this simple yet tasty appetizer. I love cooking with mushrooms because just 10 minutes in a hot pan can transform them from something quite plain, to golden nuggets of deep earthy flavour. They also seem to pair well with a variety of ingredients, from garlic, butter and cheese to bacon, beef and eggs. I chose to pair them with pancetta in this recipe, but you could swap that out for regular bacon, or bacon bits. If you want to leave the pork out completely, just be sure to add a bit more salt when seasoning the mushrooms. 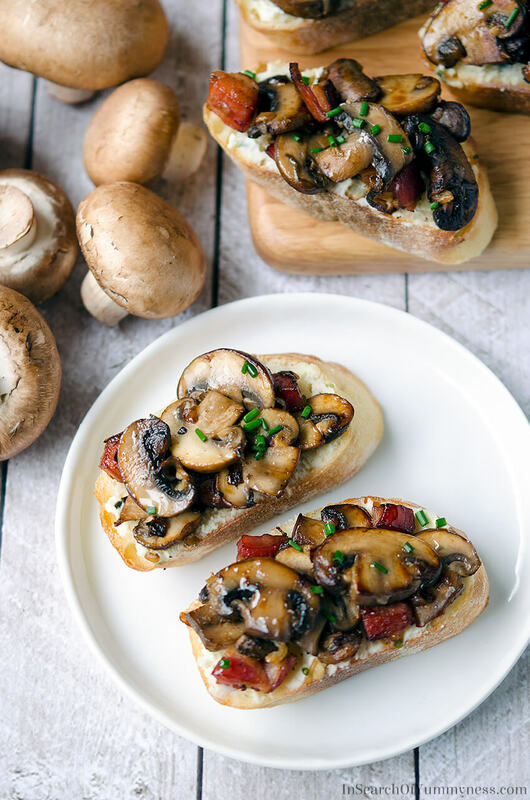 While you could make this recipe with white button mushrooms, I don’t think they would stand up as well next to the pancetta. And on the flip side of that, a portabella mushroom would be too intense for such a simple appetizer. Cremini mushrooms are definitely the way to go here! Try making these crunchy and satisfying cremini crostini for your next summer dinner party. They don’t take very long to make, and you can even prepare the mushroom mixture ahead of time, then assemble them right before your guests arrive. Either way, they are sure to be a hit, and no one will know that you didn’t spend all day in the kitchen. Get the recipe for these cremini and pancetta crostini on the Produce Made Simple website. I have been compensated to create this recipe for Produce Made Simple. Shareba, these are mouth-watering! I love the fact that I can make the mixture ahead of time. Great flavours! These look so tasty! Pancetta is one of my all-time favourite ingredients to use because it’s so versatile! I will definitely have to try these for the next dinner party I host — they are pretty simple but look amazing! Thanks Gabby! If you do end up making them, let me know how they turn out! Yum, these look delicious. I love anything that involves mushrooms and I think you’re right about cremini’s being a perfect balance with the pancetta. This looks delicious! I need this now! Thanks Carmy!! If you like mushrooms, you’ll probably love these!